Do you have benches or a low wall in your park? Or if you run your sessions indoors, do you have access to portable benches and steps? If so, today’s drills are for you. I have three drills for you to make use of your surroundings and to mix things up for your clients a little. For this drill you will need access to some benches. These exercises are done for 2 minutes on, then 30 seconds rest. Each round has two exercises. Exercise 1 is done for reps. Once a camper has completed all of the reps they do exercise 2 until the end of the 2 minutes. Step Up Squat Step Up: 1 rep = step up, squat on the step, step down, step up with other leg, squat on the step, step down. Repeat this drill a second time to make it a 20-25 minute drill or just once as a finisher. This workout requires a bench or a low wall that clients can step on. As a group start at part 1 and go through to part 4, then head back to part 1. Complete this circuit as many times as possible in 4 minutes. 1 minute on each exercise. Complete once through. Repeat parts 1 through 4 two to three times as your time allows. This workout is a simple strength workout done in pairs. Campers should find a partner who is similar in strength level. They will be working through the exercises below, taking it in turns to complete a set. Feet Elevated Push Ups are 2 → 10 so Partner A does 2 rep and then Partner B does 2 rep. The first number is 2 so the reps increase by 2 each set. So Partner A does 4 reps, then Partner B does 4 reps, A does 6 reps, B does 6 reps, A does 8 reps, B does 8 reps, A does 10 reps and finally be does 10 reps, the second number shown next to the exercise. Complete the exercises in any order. The drills this week are brought to you by BootCraft. 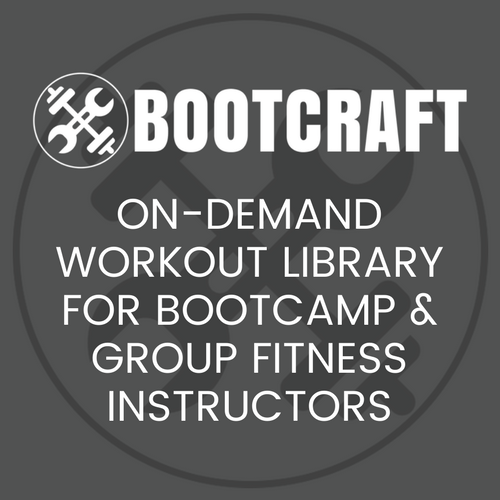 BootCraft is an online group fitness drill search engine that searches through a database dozens of high quality workout ideas. Need a strength drill? Easy. How about a fresh warm up idea? Done. Just check the boxes and get the drills you are looking for. On demand, whenever you need it. Access only requires a low monthly fee, and from now until the end of December you can also lock in the special Founders price. Thanks Kyle. I signed up last night and used the One Arm DB this morning. It went down really well and ran perfectly to time – thanks! In fact nearly 200 trainers have become a member already and are loving the easy access to new ideas.